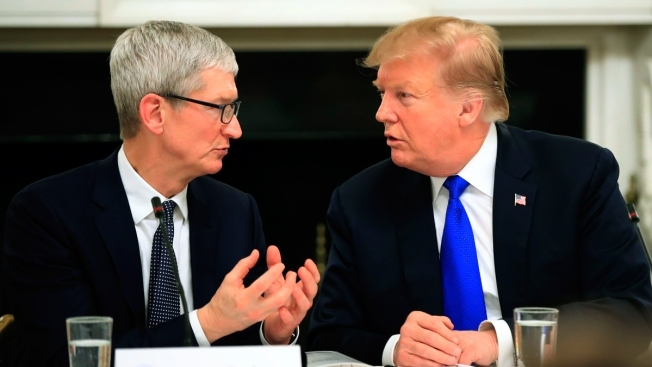 FILE - In this Wednesday, March 6, 2019 file photo, President Donald Trump talks to Apple Inc. CEO Tim Cook during the American Workforce Policy Advisory Board's first meeting in the State Dining Room of the White House in Washington. The comment brought about a wave of jokes online, including from Tim Cook himself who changed his last name on Twitter to the Apple logo. The original statement came at a White House meeting Wednesday of the American Workforce Policy Advisory Board, of which Cook is a member. Following Trump’s remarks, people immediately joked about Cook’s new name on Twitter. Cook himself got in on the joke, changing his last name on Twitter to an Apple logo emoji. You can see Trump’s “Tim Apple” moment in the video below.